Powerful 1.300 W motor. Orbital and reciprocating action. Electronic Power Control. Adjustable speed 0 - 2.400 SPM. Electronic overload protection. Weighs only 3.5 kg. Capacity. 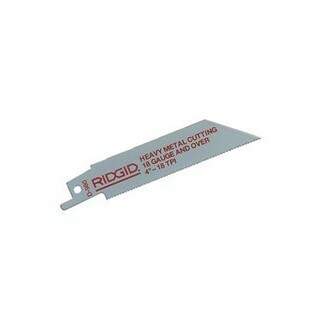 RIDGID D-989 Wood Roughing 6 inch Saw Blade. Bi-Metal Universal Single Shank Reciprocating Saw Blade. Recommended for use with RIDGID® 530 machines. Bi-Metal Universal Single Shank Reciprocating Saw Blade. Recommended for use with RIDGID® 530 machines. 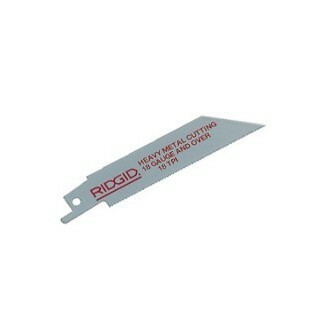 RIDGID D-973 Wood Roughing 8 inch Saw Blade. Bi-Metal Universal Single Shank Reciprocating Saw Blade. Recommended for use with RIDGID® 530 machines. RIDGID D-9999 General Purpose Including Wood with Nails 12 inch Saw Blades. Bi-Metal Universal Single Shank Reciprocating Saw Blade. Recommended for use with RIDGID® 530 machines. RIDGID D-974 General Purpose Including Wood with Nails 8 inch Saw Blades. 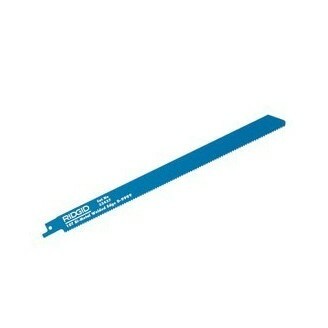 Bi-Metal Universal Single Shank Reciprocating Saw Blade. Recommended for use with RIDGID® 530 machines. RIDGID D-975 General Purpose Including Wood with Nails 12 inch Saw Blades. Bi-Metal Universal Single Shank Reciprocating Saw Blade. Recommended for use with RIDGID® 530 machines. 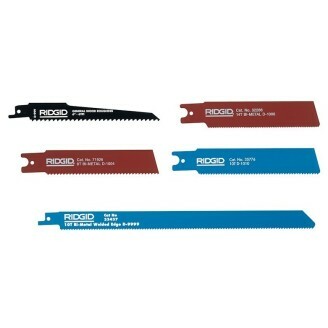 RIDGID D-984 Non-Ferrous Metals, Sheet Steel 4 inch Saw Blades. Bi-Metal Universal Single Shank Reciprocating Saw Blade. Recommended for use with RIDGID® 530 machines. 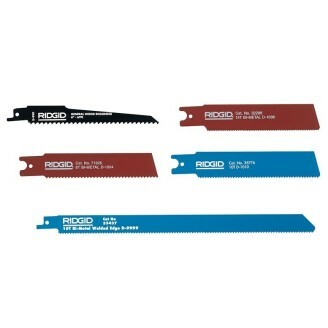 RIDGID Model D-985 Non-Ferrous Metals, Sheet Steel 6 inch Saw Blades. Bi-Metal Universal Single Shank Reciprocating Saw Blade. Recommended for use with RIDGID® 530 machines. 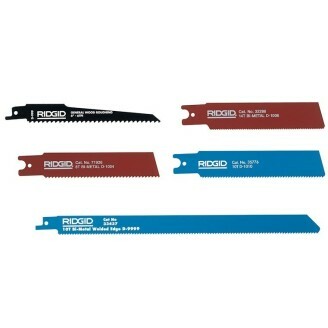 RIDGID Model D-1014 Non-Ferrous Metals, Sheet Steel 8 inch Saw Blades. Bi-Metal Universal Single Shank Reciprocating Saw Blade. Recommended for use with RIDGID® 530 machines. RIDGID Model D-980 Non-Ferrous Metals, Galvanised Steel Pipe Tubing 4 inch Saw Blades. Bi-Metal Universal Single Shank Reciprocating Saw Blade. Recommended for use with RIDGID® 530 machines. RIDGID Model D-986 Non-Ferrous Metals, Galvanised Steel Pipe Tubing 6 inch Saw Blades. Bi-Metal Universal Single Shank Reciprocating Saw Blade. Recommended for use with RIDGID® 530 machines. RIDGID Model D-971 Non-Ferrous Metals, Galvanised Steel Pipe Tubing 8 inch Saw Blades. Bi-Metal Universal Single Shank Reciprocating Saw Blade. Recommended for use with RIDGID® 530 machines. RIDGID Model D-972 Non-Ferrous Metals, Galvanised Steel Pipe Tubing 9 inch Saw Blades. Bi-Metal Universal Single Shank Reciprocating Saw Blade. Recommended for use with RIDGID® 530 machines. 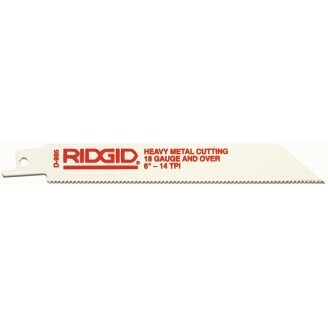 RIDGID Model D-999 Non-Ferrous Metals, Galvanised Steel Pipe Tubing 2.5 inch Saw Blades. Bi-Metal Universal Single Shank Reciprocating Saw Blade. Recommended for use with RIDGID® 530 machines. 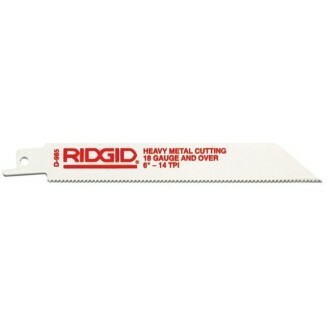 RIDGID D-987 Sheet Steel and Tubing 6 inch Saw Blade. Bi-Metal Universal Single Shank Reciprocating Saw Blade. Recommended for use with RIDGID® 530 machines. > 0.02" < 0.06" (> 0,4 mm < 1,5 mm) wall thickness. 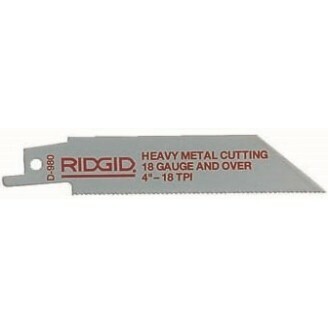 RIDGID Model D-1015 Abrasive Materials 8 inch Saw Blade. Bi-Metal Universal Single Shank Reciprocating Saw Blade for Abrasive Materials. Recommended for use with RIDGID® 530 machines. > 0.02" < 0.06" (> 0,4 mm < 1,5 mm) wall thickness. 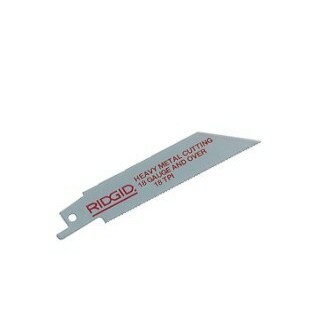 RIDGID D-1009 Heavy Wall Steel Pipe 12 inch Sawing Blade. Bi-Metal Double Shank Reciprocating Sawing Blade. Recommended for use with RIDGID® 550 machines. > 0.12" < 0.24" (> 3 mm < 6 mm) wall thickness. Come as single not pack. 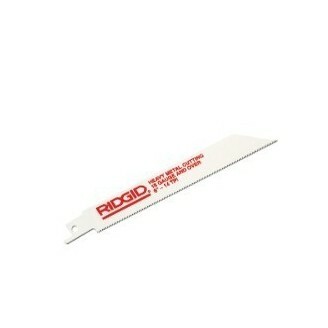 RIDGID Model D-1006 Steel Pipe, Nail-Embedded Wood and Universal Applications 6 inch Sawing Blade. Bi-Metal Double Shank Reciprocating Sawing Blade. Recommended for use with RIDGID® 550 machines. > 0.06" < 0.16" (> 1,5 mm < 4 mm) wall thickness. 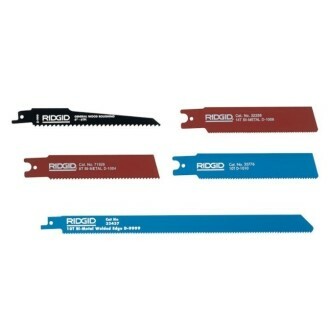 RIDGID Model D-1007 Steel Pipe, Nail-Embedded Wood and Universal Applications 8 inch Sawing Blade. Bi-Metal Double Shank Reciprocating Sawing Blade. Recommended for use with RIDGID® 550 machines. > 0.06" < 0.16" (> 1,5 mm < 4 mm) wall thickness. 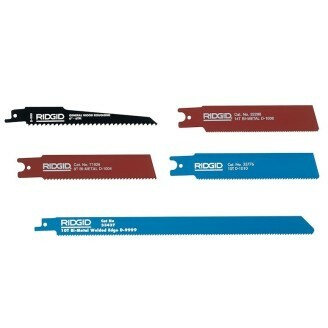 RIDGID Model D-1008 Steel Pipe, Nail-Embedded Wood and Universal Applications 12 inch Sawing Blade. Bi-Metal Double Shank Reciprocating Sawing Blade. Recommended for use with RIDGID® 550 machines. > 0.06" < 0.16" (> 1,5 mm < 4 mm) wall thickness. RIDGID Model D-1011 Wood Roughing 12 inch Sawing Blade. Bi-Metal Double Shank Reciprocating Sawing Blade. Recommended for use with RIDGID® 550 machines.